Easter and Spring Postcards | Christopher Arndt Postcard Co. Select from a beautiful selection of postcards to celebrate Easter and the arrival of Spring. 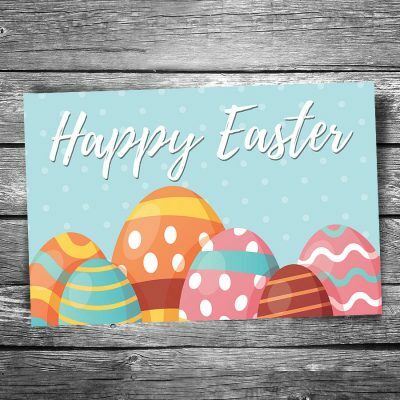 A cheerful postcard wishing the recipient a “Happy Easter” along with a bunch of decorated Easter eggs. Size: 4″x6″ — 24-04-01 | © Christopher Arndt Images. Artwork used based on various designs by Freepik.com. Used with permission. 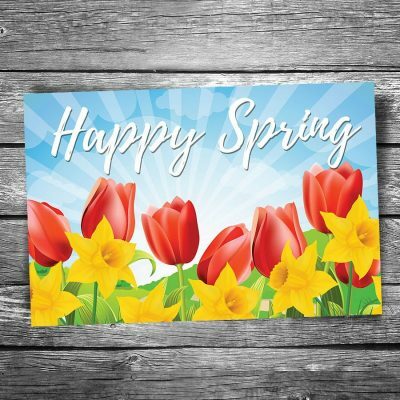 A cheerful postcard welcoming the arrival of spring. Features blazing red tulips yellow daffodils with sun rays in the background. Size: 4″x6″ — 24-04-02 | © Christopher Arndt Images. Artwork used based on various designs by Freepik.com. Used with permission.